Mi Chunche: Did you know this? Yesterday a close friend of mine forwarded an email to me about those rolls of food wrapping product we all use and I just had to share this with all of my readers. "I've been using aluminum foil for more years than I care to remember. Great stuff, but sometimes it can be a pain. You know, like when you are in the middle of doing something and you try to pull some foil out and the roll comes out of the box. Then you have to put the roll back in the box and start over. The darn roll always comes out at the wrong time. Well, I would like to share this with you. Yesterday I went to throw out an empty Reynolds foil box and for some reason I turned it and looked at the end of the box. And written on the end it said, "Press here to lock end". Right there on the end of the box is a tab to lock the roll in place. How long has this little locking tab been there? I then looked at a generic brand of aluminum foil and it had one, too. I then looked at a box of Saran wrap and it had one too! I can't count the number of times the Saran warp roll has jumped out when I was trying to cover something up. I'm sharing this with my friends that did not know this. If you all ready know this, delete this message and don't e-mail me and make me feel dumber than I already feel. If you didn't know this, e-mail me and let me know so I won't feel so dumb. I hope I'm not the only person that didn't know about this." "Okay, I have to admit I didn't know this either! 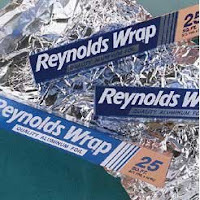 I went to the pantry after supper this evening to get foil to wrap up the leftovers and sure enough, the Glad Wrap, Saran Wrap, Reynolds Aluminum, Waxed Paper and some off brand foil all have the tabs to lock the roll. I showed the roll to John and asked him if he knew this and he didn't either. We both feel so dumb, right along with you. How did we get to be almost 60 years old and not know this? Wait until I share this with my family. Let's see how many of them already knew this. I'll let you know." I am in the ignorant club as well! Had no idea. . . Learned something new (and useful) today! Mine is in Spanish so I still don't know how lock it in! I had no clue. I guess the old, "You learn something new everyday," rule applies still. metálico. Both of whom emigrated from Cuba during the Bay of Pigs campaign. They all have financial ties to Hugo Chavez and Hugo de Naranja. I checked it out on snopes so it's all true. How will I know what to do?!?! There is simply a half-moon shaped punch-out. Teaches me for buying the great value and surefresh brand. Hmmm. A 1994 Cut-Rite wax paper box did not have the retaining tabs. Wow, I´m impressed! Never knew anyone that could keep a box of waxed paper around for 14 years. After passing this information along, someone had the nerve to smugly reply with "Oh I already knew that." I'd like to smack her.